The many ways in which mankind can produce natural compounds with biotechnology, impresses me. Smells, tastes, maybe texture in the near future, remember the synthetic burger, they are excellently produced by the bioreactor. One would expect that food industry would use this to introduce a new product line of industrially prepared AND healthy and qualitatively superior food – but that does not happen. Food advertising keeps treating us as a bunch of nitwits. Many concerned consumers feel that they are being deceived by food industry. Therefore, they increasingly move to organic food, prepared according to traditional methods. Nothing wrong with that, for who can afford it – but then, the choice for organic is essentially one in need of other quality hallmarks. 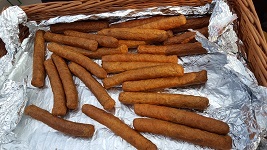 Food technology old style: the frikandel. Often, organic agriculture is criticized for its inability to feed the world, because of its lower yields. I agree; but here, my subject is something else: the idea that only organic food, prepared according to traditional methods, has real quality. Nowadays, food industry can prepare excellent food, but there is a growing divide between their competence and what they show to their customers. In the past, there were often good reasons for this. If I’m not mistaken, increasingly better food technology was used to mask inconveniences, more or less up to the turn of the century. Fifty years ago, the man who told me that he would never eat sausages any more after having worked in a sausage factory for a month, made a big impression on me. Industry discovered technological means to process more and more components of the pig into tasty, i.e. attractively priced products. In the Netherlands, this led to the development of the frikandel, among others. This was the old capitalistic model: selling lower quality at a higher price. But the pitcher goes so often to the well that it is broken at last; the price that food industry paid for this was that a premium sector of consumers developed a deeply rooted distrust in it. What to do if this distrust would seep through to wider population strata, as often occurs with emotions like these? 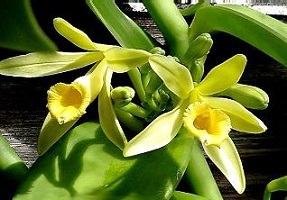 Modern biotechnology can produce even purer vanillin than the vanilla orchid. Photo: Wikimedia Commons. Meanwhile, biotechnology has radically changed technological opportunities for the food industry; yes biotechnology, often scorned upon, a technology that is looked upon by many people as just an intensified continuation of the old coarser chemical technology. But on the contrary, biotechnology offers us the opportunity to produce substances almost in the same way as living nature. Nowadays industry can produce almost pure vanillin (even of better purity than the product from the vanilla orchid), and valencene, the orange fragrance and flavouring, and nootkatone, the grapefruit fragrance and flavouring. Often added to vanilla ice cream, and orange and grapefruit juices of course. But would industry proudly publish these achievements? No, on the contrary, it hides them. It has been allowed to call these biotechnologically produced substances ‘natural flavourings’, and in doing so it hides their industrial provenance. Industry itself seems to be caught in the concept that industrially produced food is of lower quality, and that only nature itself can produce the quality that we deserve as human beings. And now about the term organic. As a real commercial term, the word organic has an important emotional meaning: non-industrial. But its scientific meaning is very imprecise; it can mean a certain process of growing the crop, or of pig or chicken husbandry, or the kind of ingredients used in the product, or the way this has been prepared. In organic agriculture, the farmer can use less fertilizers and less pesticides and fungicides; essentially because organic agriculture only allows agricultural processes developed before 1880. Not always with a positive outcome. The case of copper sulphate is well-known, highly toxic for humans and animals but allowed in organic agriculture for treatment of mildew (Bordeaux mixture); the substance accumulates in the soil and kills microorganisms. Its application as a fungicide was discovered only in 1870, it does not represent ancient wisdom. In most countries the agent has been banned now. Most modern agricultural technologies (included integrated agriculture, that likewise aims to reduce environmental effects) are not allowed in organic agriculture. The organic concept is popular and that testifies to today’s prevailing anti-technological mood. But technology has moved on. Nature disrupting and hard technologies have grown out of fashion, environmentally friendly and benign technologies have become the standard now; but that has not yet had an influence on public perception of technology. Maybe that is because many people imagine ‘technology’ to have to do with ICT nowadays, not with intervening in nature. The public image of chemical technology, including biotechnology, has been frozen in the 1970s. 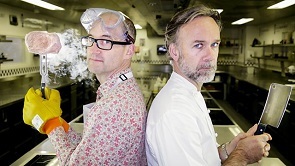 On 23 March 2016, the BBC broadcast a show with scientist Professor Mark Miodownik and two-Michelin-star chef Marcus Wareing on the issue who could prepare the best tasting meal (entry, main course and dessert). Photo: BBC. We draw three conclusions from these considerations. Firstly, food industry should be much more proud of its biotechnological achievements and show them; above all, show to what extent it is capable now to produce good food using modern technology. And what is better suited to publicize this than the creation of a new luxury series of excellent and healthy food, produced with modern technology, and marketed as such? In this way, industry can show that high quality does not necessarily require a preparation according to traditional methods: that by using biotechnology, it may even produce better quality than the craftsman. These days, there are shows on TV where chefs compete with biotechnologists: who prepares the best tasting food? The chefs do not always carry the victory, biotechnology creates new opportunities. Secondly, modern concerned consumers should delve somewhat deeper into the many-sidedness of the concept of organic, and start to formulate more differentiated wishes. For instance, what is more important? That the chicken has a good life, or that it has been fed with organic maize? In actual practice, this is all lumped together – not really required for providing good quality! Thirdly, agriculture should start using faster the new discoveries of agricultural science; showing more clearly that on this basis, it can be ecologically responsible – meaning that also for growing crops, the term organic is not the only hallmark of good quality any more. If we let ourselves be caught in the popularity of the term organic, we are marking time and do not make use of the potential of modern and mild technologies.